To ensure that Community Corrections program participants are actively engaging in their recovery, random drug testing is performed. Participants in the drug-testing program can include defendants who are under OCC Pretrial Supervision, enrolled in Electronic Monitoring or on probation. OCC also provides drug-testing services to the Department of Health and Human Services (DHHS). The DHS Children's Protective Services refers parents for drug testing whose homes have been raided by drug enforcement officers or parents suspected of abuse and/or neglect. The PH and creatine level of the specimen is tested to detect potential oral tampering of the specimen. The Court and the Probation agent are notified of positive tests, for any potential sanctions. 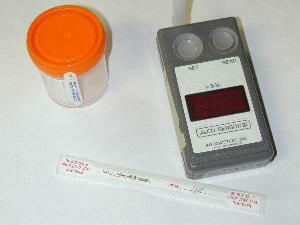 Over 11,000 drug tests are performed annually. OCC staff receives training on how to detect drug usage in clients. Certain behaviors are typical among actively using substance abusers. When staff observe changes in behavior, additional intervention is pursued. Staff are trained in performing substance abuse assessments, such as the ASI (Addiction Severity Index). Completed assessments are forwarded to the Community Assessment and Screening Services (CASS) agency for potential placement in treatment.